HISPANIC EMPLOYMENT PROGRAM Training of supervisions on Rock Island Arsenal GOOD afternoon. My name is Ernest Rodriguez, HEPC for HQ, ARRCOM. I've been asked to substitute for Tony Tafoya, HEPC for RIA to present an orientation on the HEP. To begin I think you are aware that the HEP is an integral part of the federal EEO program and therefore is a management program. 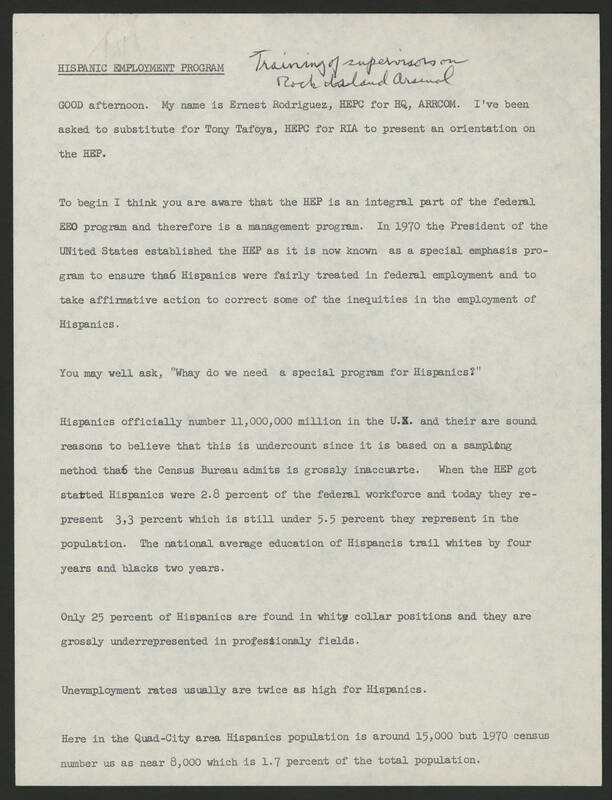 In 1970 the President of the United States established the HEP as it is now know as a special emphasis program to ensure tha6 Hispanics were fairly treated in federal employment and to take affirmative action to correct some of the inequities in the employment of Hispanics. You may well ask, "Whay do we need a special program for Hispanics?" Hispanics officially number 11,000,000 million in the U.X. and their are sound reasons to believe that this is undercount since it is based on a sampling method tha6 the Census Bureau admits its grossly inaccurate. When the HEP got present 3,3 percent which is still under 5.5 percent they represent in the population. The national average education of Hispanics trail white by four years and blacks two years. Only 25 percent of Hispanics are found in whit collar positions and they are grossly underrepresented in professionaly fields. Unevmployment rates usually are twice as high for Hispanics. Here in the Quad-City are Hispanics population is around 15,000 but 1970 census number as near 8,000 which is 1.7 percent of the total population.